A. Field dimensions: The field of play shall be rectangular. Its length being no more than thirty (35) yards or less than twenty (25) yards and its width not more than twenty (25) yards nor less than fifteen (15) yards. The length in all cases shall exceed the width. 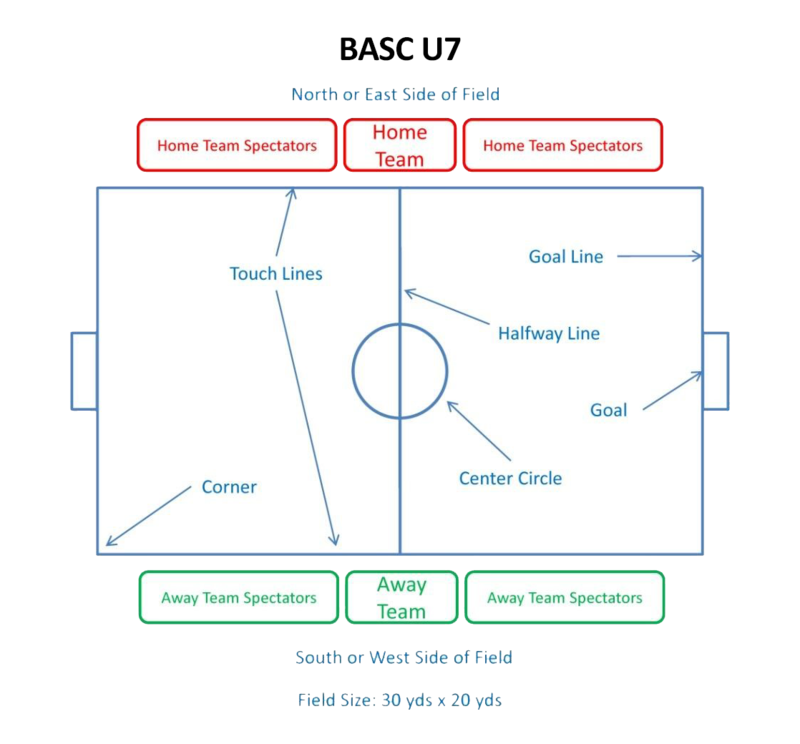 BASC U7 fields are approximately 30x20. 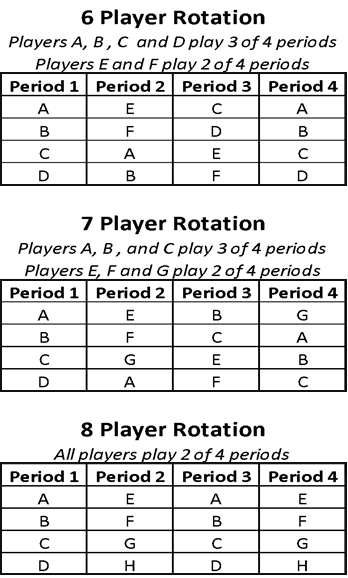 Roster Size: Teams are to be formed with a maximum of 8 players; the recommended roster size is 6 players. Uniforms: Team uniforms shall consist of like colored jerseys, shorts and socks. Each player shall have a number on the players jersey. The number shall be affixed to the back of the jersey and shall be clearly visible. Each player on a team must wear a number different from the number of every other player on thier team. The official team roster shall include the number of each player’s jersey. No player names on jerseys. Practices: Three team activities per week including games, practices, scrimmages, classrom training, etc. No single activity shall exceed 90 minutes in duration with the exception for a fifteen (15) minute allowance for warm up prior to the start of physical activity. Weeks are considered Saturday through the following Friday. Non-soccer related activities such as team parties, team fundraisers, volunteering, etc. are not considered team activities/practices in respect to this rule. Mercy Rule: There will be a 10 goal mercy rule if the losing coach requests it. The Mercy Rule cannot be applied until the first half has ended. The losing coach must notify the referee at halftime if invoking mercy rule. Post-Game Sportsmanship: All players and coaches should congratulate each other for a game well played with handshakes/high fives along the halfway line. Parents are encouraged to form tunnels and cheer for players as they return to the sidelines.